About a dozen Amish waited for news concerning a proposal involving a dispute which focused on the lack of chemical treatment of human waste from privies at their residences on state Route 47 outside Maplewood. 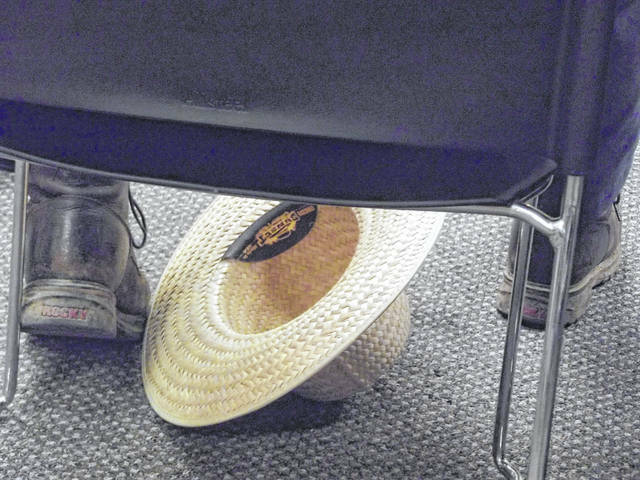 SIDNEY — A tentative agreement ending a dispute involving several Amish families, who live outside Maplewood, was reached Wednesday night, March 20, during the Sidney-Shelby County Board of Health meeting. The dispute focused on the lack of chemical treatment of human waste from privies before it was applied to their crops and the alleged lack of action by the property owners to remedy their sewage-handling system to prevent potential health problems for themselves and adjacent properties. The proposed agreement calls for the four Amish families involved in the legal action — Joseph A. and Mattie E. Schwartz, 21720 State Route 47, Daniel J. and Mary D. Schwartz, 21450 State Route 47, Henry A. and Sarah E. Schwartz, 21690 State Route 47, and, Jacob R. Schwartz, 21500 State Route 47, all of Maplewood — to install a gray water system and the addition of lyme to the sewage to bring the PH balance to 12 before spreading it as fertilizer. The waste in the privies will also have to be covered. The agreement was brokered following an executive session which included Shelby County Prosecutor Tim Sell and Assistant Prosecutor Eric Ambos. “I met with the health board, and they gave me the authority to resolve the case,” said Sell, Thursday afternoon. “This deals with a proposed order worked out between the attorneys. Sell said there’s an agreement in principal in the case, as there is still some language which needs to be finalized. The Amish have been living on the land and disputing with the board for approximately two years. • Acceptance of the 2020 proposed budget. • Scott Barhorst,3312 Tawny Leaf Court, Sidney, requested a variance of 3 feet from a well when building a one-car garage. Ohio law requires 10 feet, but variances have been granted for up to 5 feet. The board passed a variance for 5 feet with the only dissenting vote made by board member Bill Gosciewski, who does not believe in voting against the state unless it presents extreme hardship for the asker. • The medical director contract with Dr. Paul W. Weber was renewed. • The employment of Courtney Gradel as part-time WIC breastfeeding peer was approved. • Discussion of the Harm Reduction Program was tabled pending appropriation of more data. • It was reported that there have currently been more hepatitis A sufferers than in all of last year. In response to this, the Health Department has held clinics for high risk people. The next board meeting will be held April 17 at 7 p.m.
Editor Melanie Speicher contributed to this report.